Welcome to Swarthmore’s QSN Chapter page! 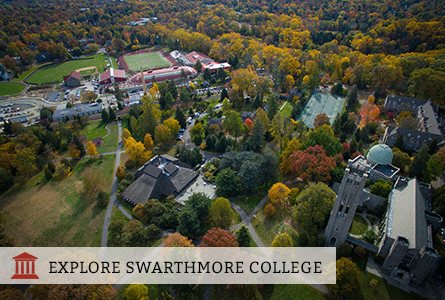 A liberal arts college located just 11 miles outside of Philadelphia, Swarthmore proves to be an exceptional institution with challenging academics and amazing opportunities! Swarthmore’s QSN Chapter is no exception. Our priority is to make Scholars feel as if they have a home away from home and we do so by connecting each other to endless amounts of resources on campus. Another exciting aspect of our chapter is that we are currently working towards gaining chapter recognition, which will allow us to further expand our initiatives. At Swarthmore, we are fortunate to have support from the administration when it comes to adjusting to college life. We kick off our year with a Welcome Event with admissions so QuestBridge Scholars can meet the individuals who read their application and understand the struggles and successes they’ve encountered to get to where they are today. We also partner up with Career Services to assist scholars with internship searches by connecting them with fellow alumni and asking questions about career advice. They also help with resumes, cover letters and interviews! When it comes to Quest events, our End-of-the-Year Banquet proves to be our most popular. We typically invite graduating seniors to share their Swat experience along with any insider tips on how to succeed as a first-generation/low-income student. It’s a wonderful time to get together and reflect on our year as a QSN Chapter. We hope that you’ll take the time to learn more about limitless opportunities that exist at Swarthmore!